NEWPORT, Ky. -- Ryan Poston's sister said she wanted the jurors to hear her brother's voice. And they did -- from a talking teddy bear. 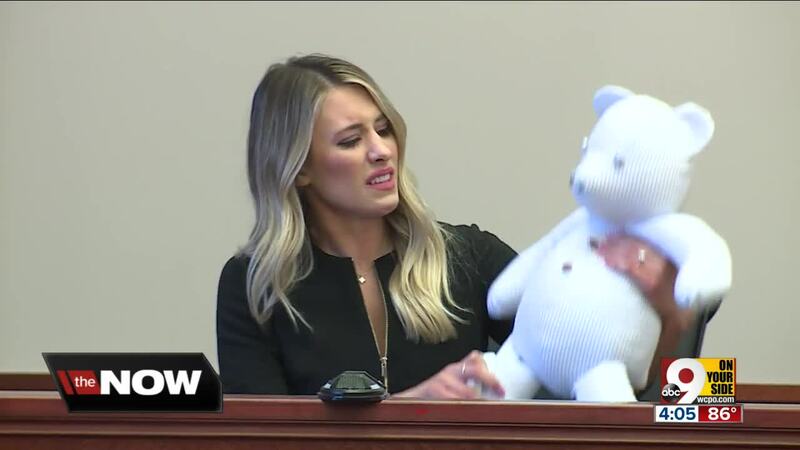 Katie Carter took the courtroom, her own family and prosecutor Michelle Snodgrass by surprise when she brought the white and blue-striped teddy bear to the witness stand Wednesday during the penalty phase of Shayna Hubers' murder trial. It turned out to be an remarkably emotional moment that left the courtroom in tears. "I'm 30 years old -- I don't need to bring a teddy bear up with me, but this teddy bear was made by Jay's sister. This is Ryan's shirt," Carter told the stunned courtroom. Then she pushed a button on the teddy bear's arm and, indeed, it seemed to play a voice from the grave. She said it was the answer message from her brother's phone. "This is Ryan Poston," the voice said. "I'm sorry, but I'm unavailable right now. If you could leave a message, I will call you back as soon as possible." As soon as the message ended, Carter quickly added: "That's it. That's all we have. A voicemail." After the hearing, reporters asked Carter why she decided to bring the teddy bear to court, and she explained. She said she got the idea when Ryan's phone rang while she was playing tennis. "These people don't know who Ryan is. They'll never get to meet him," Carter said. "So why don't bring a piece of Ryan in there, into that courtroom, and show them who he is -- the softness of his voice?" 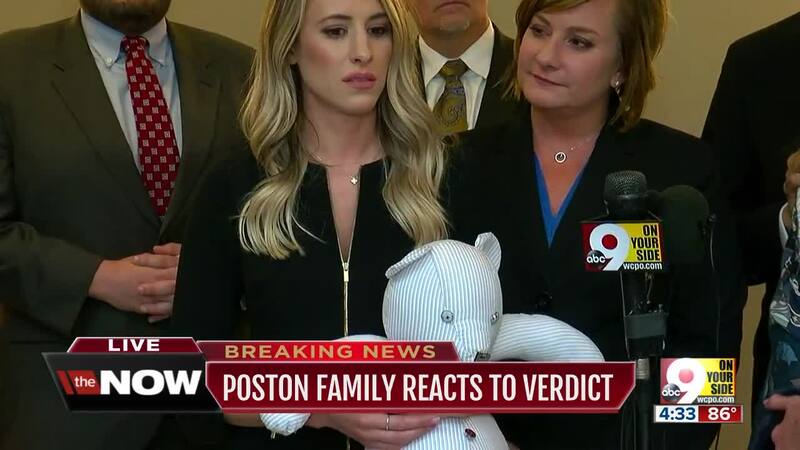 It was a deeply emotional day for the Poston family. Ryan Poston's step-father and father told the media gathering what they missed most about losing Ryan after Hubers shot him to death in his Highland Heights condo in 2012. The hugs, Pete Carter said. "He touched a lot of people," Ryan's step-father said. "We've gotten notes from people all over the world. Ryan went to school in various places as we lived all over the world, and they've all reached out to us to tell us that they're with us, they're praying for us. That's the kind of loss and the hole that it leaves -- as Katie said, 'a hole in her heart' -- because that's what it feels like." "I will forever miss the possibilities," Ryan's father, Jay Poston, said. "We will never know the incredible possibilities that Ryan Poston would have given to this earth. He was a tremendously gifted young man. The sky was the limit. A United States senator or congressman -- anything was within his grasp. He was a tremendously gifted young man." RELATED: Jury recommends life sentence for Shayna Hubers.